Elaeagnus umbellata , Thunb. subsp. parvifolia (Royle )Servett. Elaeagnus umbellata , Thunb. var. parvifolia (Royle) C.K.Schneid. Elaeagnus umbellata , Thunb. var. coreana (H.Lev.) H.Lev. Elaeagnus umbellata , Thunb. var. typica C.K. Schneid. Elaeagnus umbellata is valued as an ornamental because of its silvery foliage and flowers and its hardiness under dry conditions. It invades grasslands and disturbed areas adjacent to the plantings, and encroachment can be rapid because of its high seed production and germination rate. It grows well on a variety of soils, including sandy, loamy, and somewhat clayey textures. It does very well on infertile soils because its roots can fix nitrogen, which has also fostered its use as a nurse plant in walnut orchards. E. umbellata seeds are ingested with fruit and dispersed by birds and mammals. Seeds are also used in some places for wildlife plantings.E. 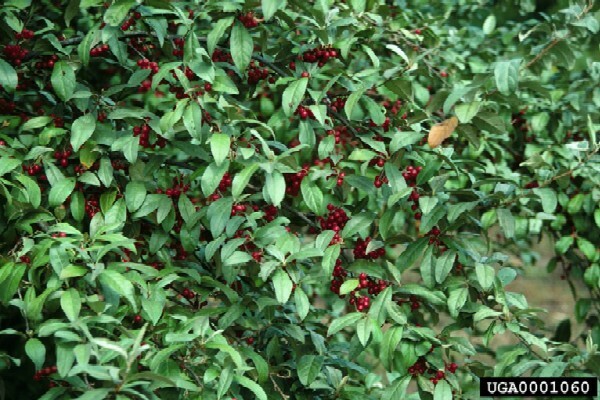 umbellata has the potential of becoming one of the most troublesome adventive shrubs in the central and eastern United States. Kaushal and Parmar (1982) state that E. umbellata is a deciduous, thorny shrub that attains a height of up to 3.5 metres. 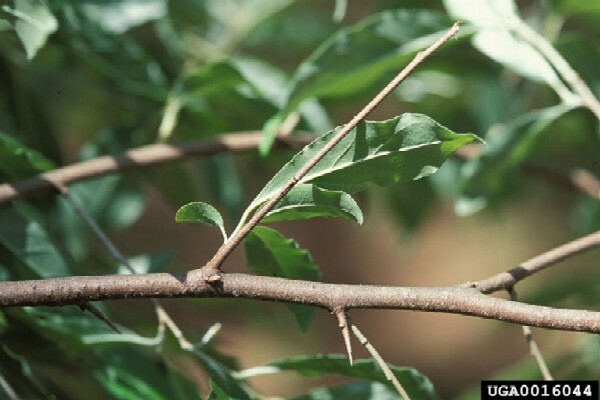 Thorns are about 2.6cm long, bearing a bunch of flowers and a cluster of leaves; bark is removable in longitudinal strips, exposing the white hardwood underneath. One important distinguishing characteristic of this plant is that its shoots and young branches are clothed with very attractive white, silvery scales that disappear with the commencement of rains. 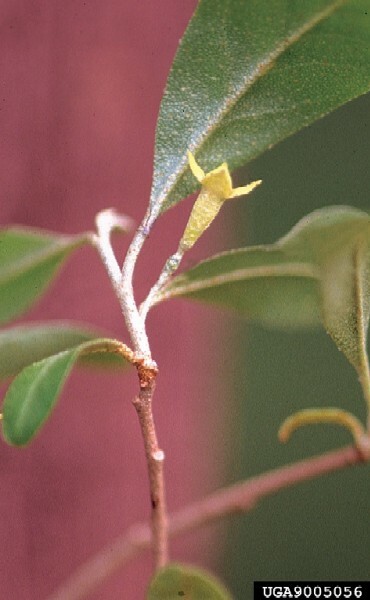 Leaves are lanceolate and alternate, variable in size, and have an average length and breadth of about 2.7 and 1.2cm respectively. They are silvery on the ventral surface and hairy on the dorsal surface in the beginning, then glabrous at maturity. Flowers are always in axillary clusters, bisexual, fragrant, stalked, white to light yellow, 8-9mm in length and 7mm in diameter. The perianth is densely scaled, four-lobed, and nearly companulate. The androecium comprises four very small stamens attached to the mouth of the corolla tube. The gynoecium is simple, has one pistil, and is 7mm long on average. Fruits are ovoid to globose, 3-9mm in length, and 5mm in diameter. The epicarp is thin, covers the whole fruit; the mesocarp is pulpy and juicy. The pedicel is 5 to 6mm long. Freshly picked fruits are coral pink. Seeds are 7-8mm in length, 2 to 3mm in diameter, and saffron yellow in colour. Cold stratification is required to break embryo dormancy (Holtz 1981, in Eckardt and Sather, 1987). Eckardt and Sather (1987) state that the effect of stratification by passing through a bird's digestive tract has apparently not been reported. Reed (1993) states that optimum germination is achieved with a minimum stratification period of 16 weeks at 10-20 deg C.
Kaushal and Parmar (1982) state that the seeds and flowers of E. umbellata are said to be used as a stimulant in coughs and the expressed oil is used in pulmonary infections. The flowers are also used as an astringent and in cardiac ailments (Watt 1890, Kirtikar and Basu, 1938, in Kaushal and Parmar, 1982). Kaushal and Parmar (1982) report that the fruits are very good to eat and they have a remarkable keeping quality and can be stored up to 15 days at room temperature; they are very rich in protein. The plant is valued as an ornamental because of its silvery foliage and flowers and its hardiness under dry conditions. Thus, it is planted as a protective hedge around fields as a well as around houses and gardens. Reed (1993) states that it provides both cover and food for a variety of birds and mammals. The foliage provides thermal and nesting cover for birds and small mammals, especially when planted as windbreaks. Because of its nitrogen fixing abilities, autumn-olive has been utilized as a nurse plant for black walnut (Juglans nigra) in Canada and the United States. Elaeagnus umbellata can grow well on a variety of soils, including sandy, loamy, and somewhat clayey textures with a pH range of 4.8-6.5 (Holtz 1981, in Eckardt and Sather, 1987). It apparently does not grow as well on very wet or dry sites (Allan and Steiner 1965, in Eckardt and Sather, 1987), but it has been described as having excellent tolerance to drought (Sharp 1977, in Eckardt and Sather, 1987). Mature trees tolerate light shade but produce more fruits in full sun, and seedlings may be shade intolerant (Holtz 1981, Nestleroad et al. 1984, in Eckardt and Sather, 1987). E. umbellata invades prairies and fields (Eckardt and Sather, 1987), and it also grows in forests in its native (Kaushal and Parmar, 1982) and alien (Reed, 1993) ranges. 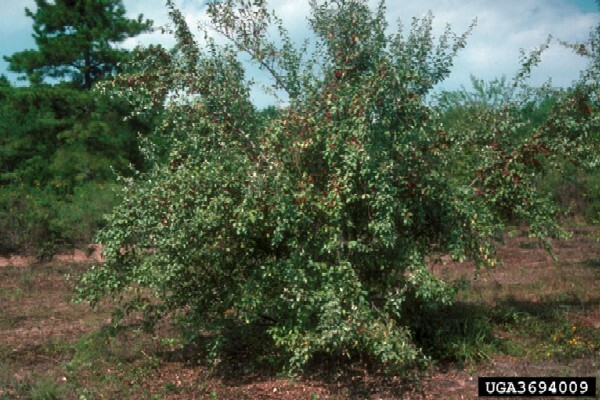 Eckardt and Sather (1987) state that Elaeagnus umbellata grows rapidly, producing fruits in 3-5 years. It produces a large amount of seed, each tree producing 1-3.5kg of seed per year and the number of seeds per kg range from 44,400 - 120,000. Elaeagnus umbellata does very well on infertile soils because its root nodules house nitrogen-fixing actinomycetes (Sternberg 1982, in Eckardt and Sather, 1987). E. umbellata was introduced to the United States for cultivation in 1830 (Rehder 1940, in Eckardt and Sather, 1987).Seeds are still distributed for wildlife plantings in some states, such as Missouri, although the state conservation department is working to stop distribution (Kurz pers. comm., in Eckardt and Sather, 1987).The plant is valued as an ornamental because of its silvery foliage and flowers and its hardiness under dry conditions (Kaushal and Parmar, 1982). Because of its nitrogen fixing abilities, autumn-olive has been utilized as a nurse plant for black walnut (Juglans nigra) in Canada and the United States (Reed 1993). 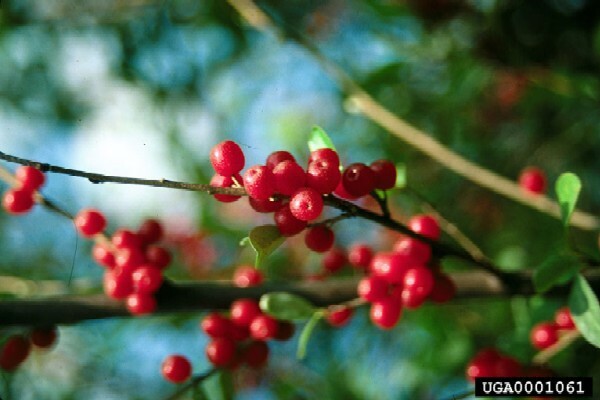 Recommended citation: Global Invasive Species Database (2019) Species profile: Elaeagnus umbellata. Downloaded from http://www.iucngisd.org/gisd/species.php?sc=262 on 21-04-2019. Eckardt and Sather (1987) cite that the nitrogen-fixing capabilities of E. umbellata has the capacity to adversely affect the nitrogen cycle of native communities that may depend on infertile soils.Eckardt and Sather (1987) state that it exhibits prolific fruiting, rapid growth, is widely disseminated by birds, and can easily adapt to many sites. It is vigorous and competitive against native species (Nestleroad et al. 1984, in Eckardt and Sather, 1987). E. umbellata seems to be a problem only in locations where small stands or rows were planted, usually within the last 10-20 years, and have begun to spread into adjacent fields or natural areas. It apparently can become troublesome where it occurs on or next to prairies with infrequent prescribed burns because it resprouts quickly after fire damage or cutting. E. umbellata is just beginning to be recognized as a potentially serious problem exotic.E. umbellata has the potential of becoming one of the most troublesome, adventive shrubs in the central and eastern United States (Sternberg 1982, in Eckardt and Sather, 1987). Preventative measures: A Risk Assessment of \r\r\nElaeagnus umbellata for Hawai‘i and other Pacific islands was prepared by Dr. Curtis Daehler (UH Botany) with funding from the Kaulunani Urban Forestry Program and US Forest Service. The alien plant screening system is derived from Pheloung et al. (1999) with minor modifications for use in Pacific islands (Daehler et al. 2004). The result is a score of 13 and a recommendation of: \"Likely to cause significant ecological or economic harm in Hawai‘i and on other Pacific Islands as determined by a high WRA score, which is based on published sources describing species biology and behaviour in Hawai‘i and/or other parts of the world.\"
Chemical: Eckardt and Sather (1987) state that since burning and cutting stimulate resprouting, herbicide treatment may be necessary to eradicate large patches of E. umbellata. One method of application is to cut the plant off at the main stem and paint the herbicide on the stump. Glyphosate is effective and commonly used. Foliar applications may be adequate for small patches; the recommended dilution of glyphosate in this case is a 1-2% solution. Dormant season basal applications (stem injections) of triclopyr alone or in combination with 2,4-D provided excellent control of autumn olive at very low concentrations (down to 1% triclopyr in diesel oil) (Kuhns 1986, in Eckardt and Sather, 1987). The lowest concentrations of triclopyr and all treatments with the 2,4- D/triclopyr combinations provided slower kills than higher concentrations of triclopyr alone, but only one of the treatment plants were expected to survive (Kuhns 1986, in Eckardt and Sather, 1987). Dicamba applied with a surfactant provided 90% total kill and severely retarded the growth of surviving stems the following year (Kuhns 1986, in Eckardt and Sather, 1987). Informations on Elaeagnus umbellata has been recorded for the following locations. Click on the name for additional informations. Eckardt N. and Sather N. (1987) Element Stewardship Abstract for Elaeagnus umbellata. The Nature Conservancy. Invasive Exotic Species Ranking for Southern Ontario - 2002 � Urban Forest Associates Inc.
Summary: Available from: http://www.serontario.org/pdfs/exotics.pdf [Accessed 7 March 2005]. Available from: http://www.hear.org/pier/species/elaeagnus_umbellata.htm [Accessed 5 February 2003]. Reed W. R. 1993 SPECIES: Elaeagnus umbellata U.S. Department of Agriculture, Forest Service, Rocky Mountain Research Station, Fire Sciences Laboratory. Kaushal M.K. and Parmar C. (1982) Elaeagnus umbellata Thunb. p. 23�25. In: Wild Fruits. Kalyani Publishers, New Delhi, India. Summary: Short report on description, habitat, yield and uses.